If you are interesting about web 2.0 sites maybe you like check them often, I mean your favorite web 2.0 sites. If you want find new web 2.0 sites maybe you can go some web 2.0 directories such as Techcrunch, MoMB, Ehub, Mashableand so on. But how do you know web 2.0 site's traffic trend? 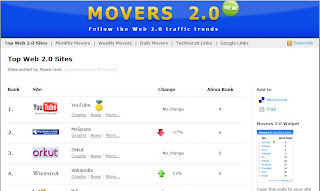 Movers 2.0 tracks web 2.0 metrics, Alexa Rank, Technorati Links, Google Links. You can see top 100 sites, and other features there. This is a good tool for track web 2.0. The Movers 2.0 was created by Eran Arkin, one of the developers on the eSnips team.